Don’t miss the Rotary Club of Raymond’s 52nd Annual Raymond Dinner and Dance Feb. 9 fundraiser. Put on your cowboy hat and dust off your boots for an evening of country hospitality and dancing with Fast Times. Proceeds will go to new Ridgeview Lodge furnishings. Fast Times, it was stated in the band’s bio, performs a wide-variety of hits with a “Fast Times twist” — covering a range of good old rock and roll, country, pop and current hits. “This six-piece variety party group will impress” — and includes mother and daughter Jackie French and Jasmine Mitchell on vocals (French is also on rhythm guitar); Gary Drayton on keys, lead and harmony vocals; Sheldon Arvay on lead guitar and vocals; Joey Steckly on bass guitar and vocals; and Ryan Dyck on drums. Fast Times, according to the band’s bio, has performed live at several southern Alberta events including the Scottie’s Tournament of Hearts, a guest artist spot with the Lethbridge Symphony Orchestra, the Lethbridge College 50-Year Anniversary, many Canada Day celebrations, and the 2006 Summer Games. The band has also opened for several Canadian artists including The Sheepdogs, Toronto, Shane Yellowbird, and Trooper. 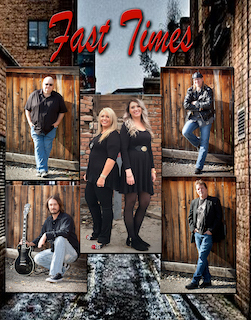 “Fast Times strives to be an entertaining variety cover band playing upbeat well-known music to play something for everyone to enjoy. Having a great sound, performing hits to the best of our ability with our own twist and we strive to have great vocals. Fast Times wants to ensure we provide a quality show for the guests to enjoy — keeping the dance floor hopping and for guests to remember having a great time,” said French. According to French, the band will also be playing Feb. 22 and 24 at Casino Lethbridge, at the All Saints Fundraiser Apr. 27 in Heritage Hall at Exhibition Park in Lethbridge, and at Average Joe’s in Lethbridge May 11 for the BACA 100-Mile Ride Dinner and Dance. To book your next event with Fast Times please contact French at 403-715-0525 or e-mail fasttimesband@yahoo.ca. All the fun starts at 6:30 p.m. at the Cultural Hall in Raymond. Tickets are $40 per person or book tables of eight for $320 or a table of 10 for $400. Tickets are available from any Raymond Rotary Club member or call 403-752-3222 or 403-393-3467. The evening includes a silent auction, jail and bail and activity booths.